improved user satisfaction and turnaround times," Roenigk says, "freeing up BI team members to focus on better stakeholder outcomes, rather than churning out reports." Some companies that have moved mission-critical applications to the cloud say the results are pleasing. Earth Networks is a Germantown, Md.-based operator of realtime sensor networks that collect weather, lightning and greenhouse-gas information; this data is then delivered to customers as cloud-based applications, including the well-known WeatherBug application. Moving to cloud services, says Andy Rosenbaum, the company's Director of Web and Desktop Development, means "we're no longer in the business of managing data centers." Other early adopters of cloud applications and infrastructure services include application developers and product engineering teams. Apart from the fact that technologists are often among the early adopters of new products, putting the application development in the cloud means IT departments don't have to purchase dedicated servers. Cloud computing also isolates the applications under development so they don't impede the day-to-day operations of the data center. For example, Fujitsu, a global provider of IT products and services (including cloud computing), uses cloud services to demonstrate its products to prospective customers. The beauty of the cloud is that a technical sales team can build a customer test bed in a matter of hours, says Carey Blunt, Chief Cloud Computing Drives Business Innovation Reasons why corporate executives support cloud computing I Drives down overall business application costs I Reduces application-configuration time I Enables virtual and distributed organization I Speeds application implementations I Provides ability to predict future application costs I Enables access to best-in-class applications I Lets executives focus on transforming business rather than IT I Encourages managers to adopt business best practices I Enables business units to quickly adapt to emerging opportunities SOURCE: The London School of Economics and Political Science, The Outsourcing Unit, survey of 1,035 business and IT executives, 2011 Architect for Service Management Tooling at Fujitsu U.K. "A salesperson can log in to a cloud service portal, drag and drop a series of icons that represent service attributes, and press a button to provision service," he says. In the past, servers and software had to be shipped to a site so a demo or proof-ofconcept system could be built. This would take weeks, further delaying the sale. Another technical company, Qualcomm, adopted cloud services among its R&D and engineering teams. As a result, the San Diego-based company, which develops chip technologies for mobile devices, has seen a two-month reduction in its productdevelopment cycles, says Matthew Clark, Senior Director of IT. "Now that we've implemented cloud computing, our application developers and engineering teams can provision systems far more quickly," he adds. "They don't have to call anybody or create a ticket. It's all done behind the scenes, and it's more than four times faster than the manual process we used to follow." With new mobile devices coming to market on a weekly basis, it's essential for Qualcomm to innovate and be ﬁrst to market with the latest enabling technologies. Cloud computing has taken much of the cost and complexity out of its business and fostered a new way of doing business. If industry analysts are right, Qualcomm will have plenty of company soon. Market research ﬁrm IDC estimates that U.S. companies will increase their use of the cloud next year by 130 percent over this year. The big drivers? Lower costs, less complexity and faster speed to market. Those are goals any organization can view as mission-critical. I KARYL SCOTT writes about technology and business from San Diego. 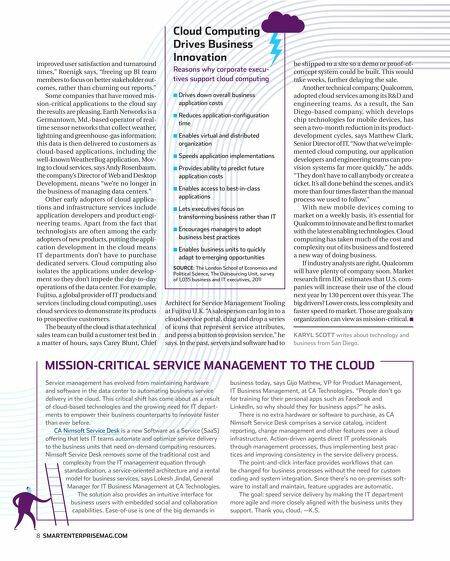 MISSION-CRITICAL SERVICE MANAGEMENT TO THE CLOUD Service management has evolved from maintaining hardware and software in the data center to automating business service delivery in the cloud. This critical shift has come about as a result of cloud-based technologies and the growing need for IT departments to empower their business counterparts to innovate faster than ever before. CA Nimsoft Service Desk is a new Software as a Service (SaaS) offering that lets IT teams automate and optimize service delivery to the business units that need on-demand computing resources. Nimsoft Service Desk removes some of the traditional cost and complexity from the IT management equation through standardization, a service-oriented architecture and a rental model for business services, says Lokesh Jindal, General Manager for IT Business Management at CA Technologies. The solution also provides an intuitive interface for business users with embedded social and collaboration capabilities. 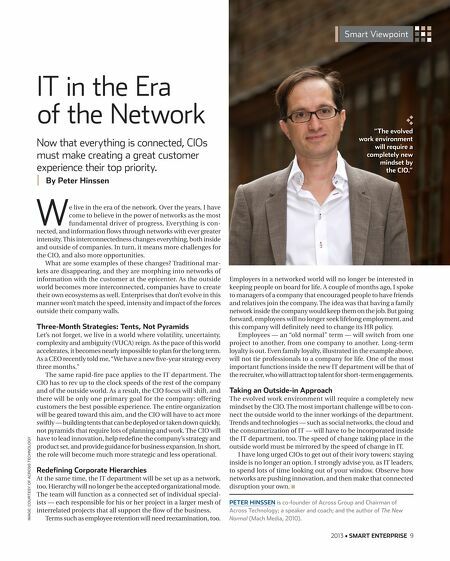 Ease-of-use is one of the big demands in 8 SMARTENTERPRISEMAG.COM business today, says Gijo Mathew, VP for Product Management, IT Business Management, at CA Technologies. "People don't go for training for their personal apps such as Facebook and LinkedIn, so why should they for business apps?" he asks. There is no extra hardware or software to purchase, as CA Nimsoft Service Desk comprises a service catalog, incident reporting, change management and other features over a cloud infrastructure. Action-driven agents direct IT professionals through management processes, thus implementing best practices and improving consistency in the service delivery process. The point-and-click interface provides workﬂows that can be changed for business processes without the need for custom coding and system integration. Since there's no on-premises software to install and maintain, feature upgrades are automatic. The goal: speed service delivery by making the IT department more agile and more closely aligned with the business units they support. Thank you, cloud. —K.S.